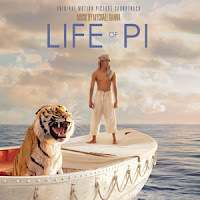 The story of an Indian boy named Pi, a zookeeper's son who finds himself in the company of a hyena, zebra, orangutan, and a Bengal tiger after a shipwreck sets them adrift in the Pacific Ocean. A 16 year-old Indian boy whose passage to a new life in America aboard a freighter ends in a shipwreck in the Pacific. He is left to fend for himself on a life raft with an orangutan, hyena and Bengal tiger. 5/5 Has a very epic feel without being epic, I hope the film is success as much as I like the score. I'm definitely looking forward to the movie.